DTV and easy money...for whom? Goethe vs Newton--"Theory of Colours"
Physics World issue on astronomy--FREE. "The scientific community has lost a bright star"
It is the custom in the Sri Lanka Association for the Advancement of Science (SLAAS), to commit a group of past-general presidents to select the oncoming general president. As some of us gathered this year for this task, we noticed an empty chair. Said ex-general presidents Priyani Soysa and Swarna Jayaweera in unison to me, "Our Charles is sadly no more". Charles, a regular member of the panel usually occupied that chair, and the absence of the short man with the long silver hair was keenly felt. I came to know of Charles's demise only when I returned from a month's holiday in Australia. He was well when I left, and I frequently troubled him with complaints regarding the school which occupied my former neighbours' bungalow and which showed scant respect for neighbours. Charles happened to be one of the directors of the school. He listened to my complaints in his usually dignified and courteous manner and promised to relay my feelings to the authorities. So I was understandably sad and felt the same way as colleagues Priyani and Swarna. We are all now in the category of "octogenarians". So we are an endangered species. It is not a surprise when one of our number is called away. But since we have known each other for so long it is hard to take too. This time it was worse for the manner in which Charles succumbed to a tragic accident was in contrast to the placid manner of the man. I first came to know Charles in 1947 when we were both new entrants to the University of Ceylon. Charles entered with a scholarship in Physics. He did a special degree in Physics during the tenure of Professor. A.W. Mailvaganam as the Head. In those days there was only one professor, and "Myla" as he was affectionately known, was Physics itself for the University students. He was feared as Dean, and admired for the clear, lucid lectures he delivered without even a piece of paper in his hand. Charles matured in the Department of Physics in this milieu, which then included such high calibre individuals like V. Appapillai, Themi Mutucumarana, Lakshman Kannangara, Osmund Jayaratna and the inimitable and amiable Indian S.P. Baliga. In time, and this was 1951, Charles as expected netted a first class honours degree, and with it the scholarship to proceed to the U.K. for his Ph.D. Charles was also promptly appointed an assistant lecturer in Physics. As was the tradition at the time, Charles too like his mentor Myla took to research on Cosmic Rays and was accepted in 1954, to research at the prestigious school in Bristol University headed by the Nobel laureate C.F. Powell FRS. It was indeed a privilege that Charles had gained by his own academic excellence, and his association with Mylvaganam, whose work on cosmic rays was one of the initial research initiatives at the then university. It was my pleasure to keep in close touch with Charles and when I too went to England the following year for my own Ph.D. Charles came to London to welcome me. I was in Sheffield and although we were far apart, we met regularly in London at the then Ceylon Students Centre. Charles was a devotee of the London temple then headed by the Rev. Sadhatissa Thera. He was always a devout Buddhist and a most disciplined individual. I recall asking Charles at the time what indeed was the importance of cosmic rays, and he as usual explained clearly to me what they were. Coming from space and incident on the high atmosphere are a relatively thin layer of charged particles which are called cosmic rays. At the time there were two important reasons for studying them. These particles moved more than a million times faster than any particles delivered by the laboratory accelerators. Collisions with other particles produced effects that were fundamental to knowledge about the structure of matter. Secondly the presence of these particles presented a cosmological problem as to from where they came. During this time there were no space explorations, and this kind of research was the forerunner to the space programmes we know of today. So Charles was very much then at the frontiers of the exciting problems in fundamental particle physics. He was well thought of as a researcher and that was saying alot. In 1957, Charles and I together with my cousin Chandi Wijesekera then doing accountancy also at Bristol, ventured on our first trip to the continent. We had meagre resources, but we managed to go to France, Germany, Switzerland, Denmark and Italy with our savings. We enjoyed the trip immensely. In Germany a Bristol colleague of Charles, Klaus Pincau, a German student also working with Powell, together with his fiancee arranged for us to lodge in a Hostel of the University of Hamburg. Klaus's fiancée Ursula, a charming girl was a student there; and the German authorities allowed us, as British University students good accommodation in their hostel in the charming village of Blankanese. We who were brought up in the colonial days to believe how cruel the Germans were, these were days after the war - were pleasantly surprised to find the contrary was true. Soon Charles completed his Ph.D., and returned to Sri Lanka. The atmosphere in Sri Lanka in the year after his return virtually put paid to any research ambitions he may have nursed. Firstly, Physics is a fundamental subject; research in this area has to be endowed with investment in state-of-the-art equipment. In any event Universities at the time were saddled with the emotional thrust for teaching in the national languages, and the necessary priorities of nursing tertiary education, fell by the wayside. This was the time I too had returned to Sri Lanka. It was a difficult time for research with support not forthcoming. We met together with other U.K.-returned contemporaries and literally "tired the sun with talking and sent him down the sky." Our respective entries into family life took us in different directions but I kept company with Charles in the scientific communities' affairs. Charles played a leading role in enhancing the language in terms of education in Physics, and he was proficient to lecture in his subjects though the handicaps with the language were great. There was no systematic scientific terminology and all of it had to be coined and drafted. Charles also continued with his active support of the SLAAS, and was elected President of the Physical Sciences section in 1974, and finally elevated to general president in 1990. His interest in the organization was sustained till the end as was his interest in the teaching of Physics. He was the Head of Physics, at the Kelaniya University for more than two decades and laid the foundation for science education there with the late Professor J.K.P. Ariyaratne. His presence will be sorely missed within the scientific community as well as his exemplary manner and ethics of conduct. Charles was above all a family man and to his wife and children go our heartfelt sympathies. They have lost a dear family head and the scientific community one of its most respected members. Emeritus Professor Charles Dahanayake, the Founder Professor of Physics and Founder Dean of Science of the University of Kelaniya passed away on February 14, 2009 at the age of 81. The following is a note of appreciation. I first met him 30 years ago, when I joined the Department of Physics of the Kelaniya University as an Assistant Lecturer (Probationary) in Physics. Ever since, I have also known him as a special, kind hearted unassuming person. He was a gentleman in every sense of the word, always ready to be of assistance with excellent advice to all who seek it from him. He was always simple and ready to look at anything in an unbiased way. His simplicity was shown in his dress, expenditure, lifestyle and basically in everything that he did. He was a good, silent observer who could fit into any occasion. Never did he speak of his achievements and if it had been done, I am sure it was solely for the benefit of the younger generations. He was liked by both his colleagues and everyone in the Faculty of Science, Kelaniya University, who all think highly of him. Prof. Dahanayake was born on February 8, 1928 at Hiyare in the hinterland of Galle. He had his early education in the village school. After completing his first certificate examination, then known as the Junior School Certificate (JSC) in Swabhasha, he moved to Vidyaloka Vidyalaya in Galle and sat the JSC in the English medium in 1944. To study science, he entered to the Senior Form at Ananda College in Colombo in 1945. During the next two years he surprised everyone by passing the Senior School Certificate (SSC) with Arts subjects, the SSC with Science subjects, London Matriculation and the University Entrance Examinations and being awarded the entrance Mathematics scholarship. Prof. Dahanayake entered the University of Ceylon in 1947 to follow the B.Sc. Special Degree course in Mathematics. He won the Muncherji Framji Khan Prize at the end of his first year at the University and got permission to complete the B.Sc. Special Degree in three years. By that time he was fond of Physics and to the disappointment of the Professor of Mathematics, he moved to the Physics Department to follow the B.Sc. Special Degree course in Physics. He graduated with a First Class (Honours) in Physics in 1951. Prof. Dahanayake started his long and successful career in Physics by joining the Physics Department of the University of Ceylon, Colombo in 1951 as an Assistant Lecturer. He moved to the United Kingdom in 1953 on a Ceylon University Government Scholarship to pursue his postgraduate studies at the University of Bristol. At Bristol, he carried out his research work on Cosmic Rays under the supervision of Prof. C.F. Powell, FRS and Noble Laureate, and obtained his Ph.D. degree in the field of High Energy Particle Physics, in April 1956. Prof. Dahanayake returned to the University of Ceylon, Colombo soon after obtaining the doctoral degree and continued his teaching and research work. He was promoted to the Lecturer Grade II in 1956 and to the Lecturer Grade I in 1961. During his sabbatical leave period in 1962, he went to the University of Rochester, USA on a Fulbright Post-Doctoral Research Fellowship to carry out research on Primary Cosmic Rays. During July 1963 to September 1967, he worked at the University of Ceylon, Peradeniya as a Senior Lecturer and continued his research work on Fundamental Particles. Prof. Dahanayake came to the Vidyalankara University (presently the University of Kelaniya) in September 1967 as the first Professor of Physics and the first Head of Physics in its newly established Faculty of Science. He was also the first Dean of Science, a post which he held for seven years, of the University of Kelaniya. One of his major contributions to the University of Kelaniya, and in particular to the Faculty of Science was the effort he put in as the Dean in getting the Faculty on to a sound footing. Prof. Dahanayake nursed the faculty from its infancy to maturity and we all in the Faculty of Science are grateful to him for his contribution. 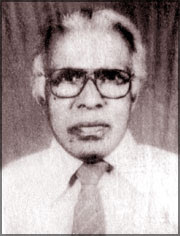 Prof. Dahanayake was a pioneer of Science in Swabhasha. He wrote a book titled Prayogika Bhawthika Vidyawa (Practical Physics) in Sinhalese. This book has become a widely used Physics book by Sinhala medium G.C.E. (A/L) students and first year Physics students of the universities. He has also translated the book by J.K. Robertson titled "Optics - Geometrical and Physical" into Sinhalese and was also a member of the Physics Glossary Committee of the Educational Publications Department. He was the Chief Editor of Vidura, a Science Magazine in Sinhala and the Chief Editor of Sri Lanka journal of Physics published by the Institute of Physics, Sri Lanka (IPSL). He was the Controlling Chief Examiner in Physics from 1971 to 1974 and the Moderator of the Physics paper from 1986 to 1990 at the G.C.E. (A/L) Examination. He was a member of the Committee to review the G.C.E. (A/L) Physics syllabus of the National Institute of Education from 1898 to 1991. The Institute of Physics, Sri Lanka (IPSL) was one of the institutions he helped to establish and he was the Founder President of it. He was a life member and a Fellow of the IPSL and was a member of the IPSL Council from its inception to his demise. He was a life member of the Sri Lanka Association for the Advancement of Science (SLAAS) and was the President of its Section E in 1974 and then the General President of SLAAS in 1990. He was a Fellow of the National Academy of Science, Sri Lanka (FNASSL) from its inception. He was a Board member of the Atomic Energy Authority (AEA) and also of the Sri Lanka Standards Institute (SLSI). He was also a member of the Sri Lanka Association for Science and Mathematics Education (SLASME). Prof. Dahanayake retired from the University of Kelaniya on July 31, 1993. He then continued as the Professor of Physics on contract basis till April 1996. He had the distinction of having served 45 years in Sri Lankan Universities, of which 29 years was at the Kelaniya University. After considering the contributions he made in the fields of Physics and Education and also to the development of the Kelaniya University, Prof. Dahanayake was appointed as an Emeritus Professor in the Physics Department, Kelaniya University in January 1997. During his retirement he continued to participate in many academic activities of the University of Kelaniya, IPSL and SLAAS and gave his advice and ideas to all who sought them from him. His keen intellect, wise guidance and gentle humour will be deeply missed.